Bullets in your Baubles 2007-2019!!! 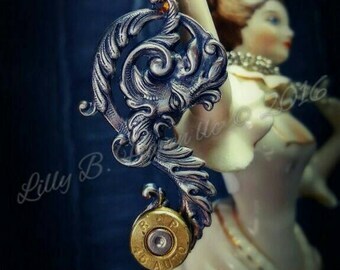 It is an honor and a JOY to have been providing Bullet Jewelry for over a decade my Giddy Darlings!!! *Did you know...after considerable research and cross referencing sellers from 10 years ago....I MAY be the ONLY Original Bullet Jeweler still keeping shop here on Etsy?!?!?! 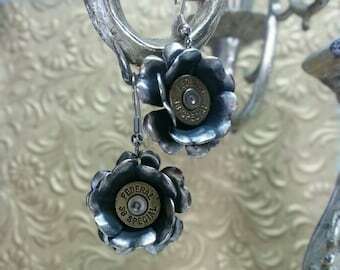 If you know of Bullet jewelers still remaining from the days before Bullets became "Trendy" I WOULD LOVE to know!!! Because EVERYONE I followed and were peers with, sadly, I can no longer find!! I will finally be listing pieces here on Etsy that have NEVER seen cyberspace!!! Pieces that I have ONLY shown in the booth will now be available for ALL not just my show clientele! So here it all comes my glorious creatures!! GRATITUDE for 12 years of amazing vending and travel enlightenment....I prepare to write the next chapter in this saga for your absolute delight!!! MUAH!! When I began "repurposing" our split casings back in 2007, I NEVER could have prepared myself for the overwhelming response I have received! My deepest and sincerest thanks to you all for the support and extremely generous appreciation for my work!! For those of you looking for the MANY items not listed here on Etsy or on my website...Shoot me a convo or come visit me on Facebook and Instagram and shoot me a message, let me know what I can delight you with!!! I will gladly build for you and then make you a listing her in the store! Since most of my items, especially the hats and bullet eyed creatures, are one of a kind...sadly, most of them I am never able to get photographed! :( But never fear!! There are ALWAYS sooooo many more on their way to completion!!! My momma ALWAYS said I missed my generation!!! I say I was placed here in this generation to remind you of the turn of the century as it will forever hold my fascination! And thus...I welcome you to my parlor! GIFT CERTIFICATES AVAILABLE!!! Shoot me a convo and I will get you a listing! June was my 11 year Anniversary and the inventory I now possess far outweighs the few meager items I have listed here! If you have met me whilst I was vending. . .you know this without a shadow of a doubt! If you saw something in the booth, just shoot me an email and let me know what you saw that tickled your fancy!! And Instagram is stellar for me!! I love being able to focus on the obscurity of capturing a shot of my work just simply "for the art of it!!" "Love is Patient, Love is Kind. Love is not Envious or Boastful or Arrogant or Rude. It does not Insist on It's Own Way; It is not Irritable or Resentful; It does not rejoice in Wrong Doing, but Rejoices in Truth!" That is the philosophical and creative rock on which I stand. . .without Love, I am NOTHING! Without Love encompassing and emoting from my being, I will NEVER create anything of great and lasting measure! These baubles will fade, but LOVE WILL NEVER FAIL!!!! Just consider this for your soul. . .Clothes Don't Make The Man! "Do you know the legend about cicadas? They say they are the souls of poets who cannot keep quiet because, when they were alive they never wrote the poems they wanted to"
The infamous Bess is ready to sing into your ear in the store!! !Merica! 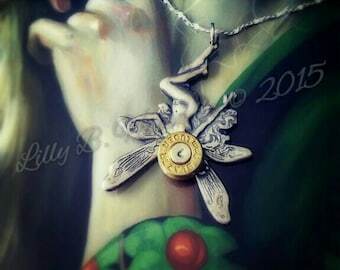 Betsy takes her place in the "Bullets in your Baubles" ranks for this summers collection!! Wash is ever so curious if you've seen that Delphine is back in stock in the store?!?!?! The Original "Bohemian Bullet" line from your Victorian Gypsy Cowgirl!! ;) Rescuing and "Makin' Pretty" all the split brass from gun ranges, landfills and dusky closets all across the globe..ok..maybe not the globe! But I try!!! In 2006 our family started into the great sport/game of Cowboy Action Shooting! Ladies....You will not have much more fun than lashing yourself into an almost rib cracking corset, tying on an obnoxious bustle and strapping on your pistols..snatching up your rifle and hossing around a shotgun!!! SERIOUSLY!!! BEST. THERAPY. EVER. So, as the buckets of split (trash, cannot be reloaded anymore) bullet casings built up..well..what does an easily entertained and highly distracted studio artist do with it...why make it pretty OF COURSE!!! :D And thus "Bullets in your Baubles" was birthed in early 2007!! I am firmly rooted in the Victorian with heavy splashes Nouveau, Baroque, Steampunk and Renaissance! Thus all of my pieces have an elegant and eclectic air about them. Most of my pieces are one of a kind and never make the Etsy store OR the website. But that's what makes it fun for you when you come visit me while I am on the road vending!! Plus, you get to fondle the baubles!! You just gotta touch 'em!! Join me on Facebook as I flit to and fro meeting the most delightful and inspiring creatures!!! And my Instagram page will fill your screen with lovely shots of the babies! @lillybhaven On these two sites you will also get to see and have the opportunity to purchase and ENJOY my true Lilly B Haven Originals....my One of a Kind Hats, Headdresses and Garments! MOST of which include, here again, Lilly B Haven ORIGINAL Bullet Eyed Skulls!!! ;) Curious? I would be purely giddy for you to come join me!!! My love and gratitude to each of you for your kindness and appreciation for my silliness and creations! MUAH!!! Me, myself and I...that sums up my extensive and highly distracted staff!! HA! I create for me!! And it makes my tail wag when I can delight ya'll with my baubles! My sincerest gratitude and a deep knee curtsey to you for playing along with me! !